The largest redevelopment project in Redondo Beach’s history was unanimously approved by the City Council early Wednesday morning, after an 8-hour hearing. The path is now open for the next version of the South Bay Galleria to include increased commercial space, affordable and market-rate apartment housing, a hotel and a skate park as part of more than $900 million in improvements. “We have a long way to go, but I’m very excited. This is one of the three reasons why I became an elected official,” said Councilman John Gran, who represents the Galleria’s North Redondo district. An additional 217,043 square feet of commercial development, a 150 room hotel and a 300 unit residential apartment complex are among the major additions to the project. The Galleria may also develop up to 175,000 square feet of commercial office space in place of retail. 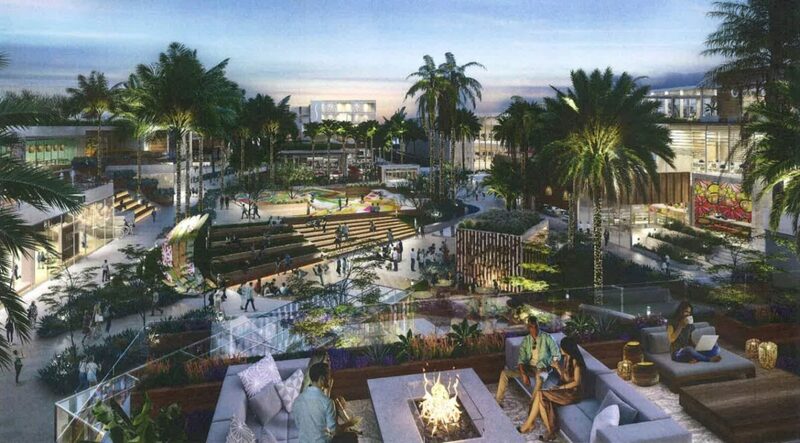 The project also includes over 6 acres of central open space, far out-sizing open areas at The Point in El Segundo, or The Grove in Beverly Hills. The Galleria approval is the first confirmed project of the area. The approval also marks the denial of an appeal submitted by resident Doug Boswell against the Planning Commission’s approval. His hearing began in early October, but was continued until after the new year, to avoid the holidays. However, Boswell’s appeal — and demands by the City Council — drove Galleria parent company QIC to make changes to the project to make it more palatable to the community. During his presentation, QIC spokesman John Alderson repeatedly discussed the potential interactions between the planned open space and its developments, especially the commercial office space. “Tenants such as WeWork and local tech startups like spaces like this,” Alderson said. Boswell’s argument against the development centered on the traffic generated by the site. The project’s Environmental Impact Report, he argued, was biased by comparing potential project impacts against the mall’s 2014 traffic, before its decline. The project should instead compare potential impacts against current-day, depressed-mall traffic, Boswell said. The residential component was clearly the least popular of the project’s proposed changes. “We have so much residential overdevelopment that adding 300 more is insult to injury. The residential development scheme needs to be halted. We’re full,” Boswell said. However, as Mayor Bill Brand noted at the beginning of the meeting, the City Council can’t prevent QIC from building housing on their property, as the Galleria’s CR – Regional Commercial zoning allows for housing development. With that in mind, a series of conditions were key to the project’s approval. Per Brand’s request, QIC accepted a plan to establish 20 percent of the development’s 300 apartments as affordable to low-income households, defined as those making between 50 and 80 percent of the area’s median income. Councilwoman Laura Emdee also ensured that LA Air Force Base employees would be able to sign leases at a reduced security deposit. That condition also states that preferred housing will be established for LA-AFB and Redondo Beach Unified School District employees in addition to affordable housing units. The Council also applied a condition that would limit the ability to build future residential development on the site, even for subsequent purchasers of property on the site. QIC also agreed to change a plan to split the 30-acre property to 59 parcels, reducing the split to 19 total parcels. Parcel division, Alderson said, is an industry practice that allows for greater flexibility to attract tenants. However, residents feared the property split was to ease QIC’s ability to flip individual parcels after completion. Another key to residents who were dubious of the project’s reliance on retail space was an increase in the project’s minimum amount of professional office space from 50,000 square feet to 75,000 square feet. The maximum amount is still capped at 175,000 square feet, as increased by the Redondo Beach Planning Commission last year. Attention on commercial office space has magnified in recent weeks, following Google’s announcement to lease over 500,000 square feet in LA’s Westside Pavilion. Westside Pavilion announced it was converting to office space last spring. Residents, including Boswell, repeatedly cited a statistic stating that 93 percent of Redondo residents commute outside the city for work. Establishing offices would create a “reverse traffic flow” and create activity in the area during the day. The project will also include an 8,000 square foot skate park, and QIC has agreed to set aside $2 million for area improvements — $1 million for street and traffic improvements on Artesia Boulevard, and another $1 million from the city’s art fund to build “functional art” (which may include benches and light fixtures) around the Artesia corridor. With those conditions in place, the council unanimously approved the project. At the meeting’s end, Boswell was set upon with staff and elected officials’ handshakes, thanks, and congratulations, including from QIC spokesman John Alderson. After the vesting tentative tract map’s approval, QIC will wait to see if the project will be challenged in a California Environmental Quality Act lawsuit. Alderson estimates the project may be completed in three-and-a-half years.